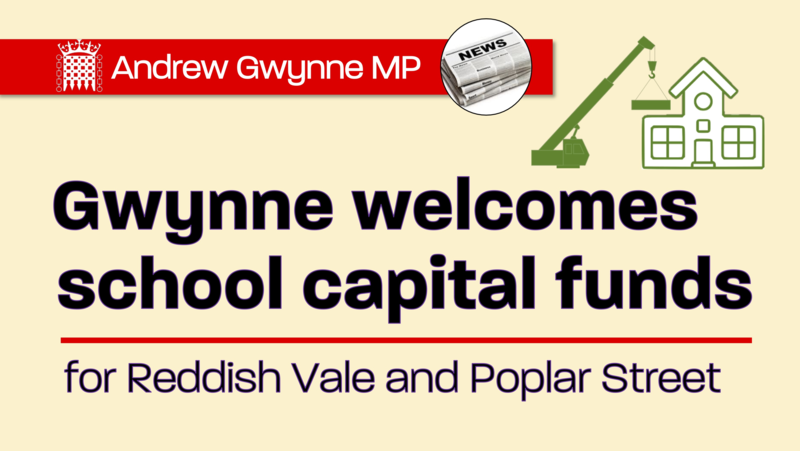 Denton and Reddish, Andrew Gwynne MP has welcomed the outcome of the Condition Improvement Fund (CIF) for Reddish Vale High School and Poplar Street Primary School. Reddish Vale High School and Poplar Street Primary School were successful in bidding for the Government’s Condition Improvement Fund, which will allow the schools to upgrade their buildings and resources. Requests were received for more than £1.4 billion for over 4,500 projects to this year’s round. Following assessment of applications, the Government have announced £433 million for 1,413 projects at 1,210 academies and sixth-form colleges. The core priority of CIF is keeping academy and sixth form college buildings safe and in good working order. The fund also supports a small proportion expansion projects for Ofsted-rated good or outstanding academies and sixth-form colleges that need to expand their existing facilities and/or floor space to either increase the number of admissions in the main year of entry or address overcrowding. The fund was heavily oversubscribed so only those projects that demonstrated a high project need and aligned with CIF priorities have been able to be funded. Schools are more than just buildings – they are the centres of our community. This is great news for pupils and staff at Reddish Vale and Poplar Street and will help to make sure our children continue to learn in buildings that are of the highest standard.